If you and your partner are adventurous and love the outdoors, it is possible that your dream honeymoon destination is Bonaire. A Bonaire honeymoon is a fabulous pick for newlyweds, since the island has so much to offer. It’s well known for exciting activities like scuba diving, snorkeling, and windsurfing. For couples that love the outdoors, there are plenty of land adventures, like rock climbing, bird watching, hiking, horseback riding, and more. Bonaire is even a great destination for exploring and learning about marine life. It has a long history of conservation and preservation and commits itself to practicing sustainable tourisms. So, if you’re hoping to find a destination that’s filled with romantic beaches and packed with action, then we think you’ll love a Bonaire honeymoon. Start planning your Bonaire honeymoon by reading this helpful guide! Bonaire’s peak season is December through April, so take your Bonaire honeymoon from May to October for cheaper rates and fewer crowds. Worried about hurricane season during your Bonaire honeymoon? Luckily the island is away from the hurricane belt and tropical storms are not a big concern no matter the season. Lac Bay: One of the world’s best windsurfing destinations, its shallows are good for beginners year-round. Kralendijik: Take a stroll through the capital and see colonial-era buildings and a long seafront. Mangazina di Rei: Receive a history lesson from the exhibits about slavery on Bonaire. Bonaire National Marine Park: Catch an island tour or get a scuba diving pass at this beautiful park. Washington-Slagbaai National Park: Explore the tropical desert terrain filled with cacti and birds. Fort Oranje: Visit this small bastion that was built by the Dutch in the 1700s. Cadushy of Bonaire: Sip on exotic liquor made from Rincon’s cacti. 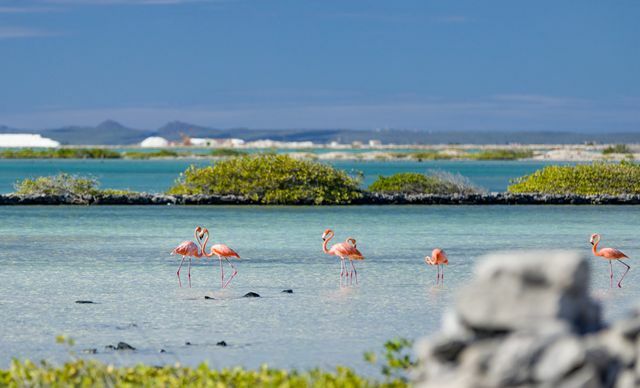 Flamingo Sanctuary: It may be off-limits to tourists, but bring your binoculars to catch a glimpse. Diving and snorkeling: Explore the underwater beauty that tourists flock to. Bonaire Museum: This old 1885 house is filled with mythology painting and folklore exhibits. Willemstoren Lighthouse: A popular spot for viewing flamingos. Donkey Sanctuary: Take a peek at these precious creatures living on their wildlife reserve. Simadan: Visit Bonaire’s harvest festival in April to taste traditional cuisine.